Eiffel Tower, two short blocks from our hotel; the “signature” photo of any trip to Paris. – -Not an easy horizontal photo to pull off! Excuse us, for we’ve been out doing a little living in France. 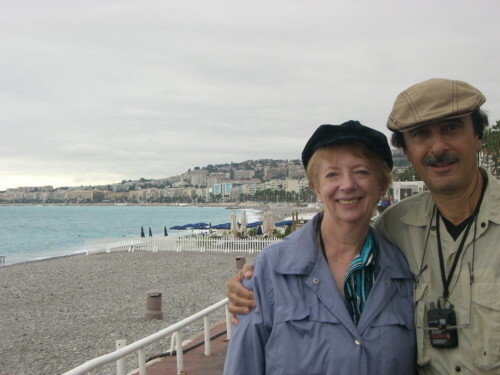 “Wife Geri” and I are fulfilling 40 years of promises to show each other places we traveled to when we were young that the other had not seen. 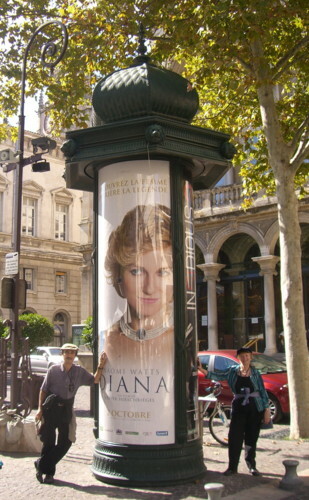 This year it was Geri’s turn to show me Paris. – – So why not see some of France while there! 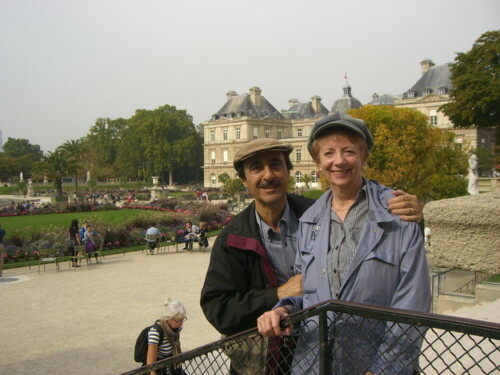 We had the good sense to arrange two pre-tour days in Paris prior to the tour’s two day Paris stay. 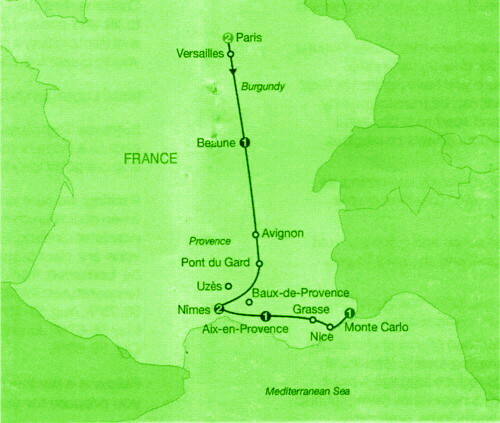 Then the tour headed south by bus to Burgundy, Provence, and to Nice and Monaco on the Mediterranean. Always the history teacher, I could not help reflect on this meaningful journey: the Roman founding of Paris on the Isle St. Louis on the Seine (river) next to Notre Dame Cathedral; the Roman Aqueduct in Pont du Gard in Provence; the Roman Colosseum in Nimes, Provence; the palace of the popes for 70 years in 14th century Avignon; the medieval stone village of Les Baux-de-Provence atop the rock cliffs. Then there was the art: the Louvre Museum with the Mona Lisa and the Venus de Milo; the Orsay Museum filled with the works of the Impressionists; the sculpture in the Rodin Museum, a former hotel where Rodin lived & sculpted; all in Paris; then down to Cezanne’s birthplace in Aix-en-Provence. 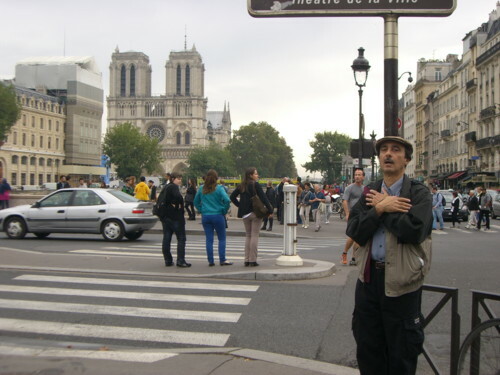 Most impressive to me was the city of Paris itself. Laid out beautifully, not a skyscraper to be seen, along the Seine, Paris is a sight to behold. Paris was transformed starting in 1852 under Napoleon III. Narrow, winding medieval streets were leveled to create the network of wide avenues and neo-classical architecture that is modern Paris. My delight was tracing some of our American Colonial past as well as our twentieth century history, all in Paris: Rue (street) de Berri where Thomas Jefferson lived as our ambassador after the American Revolution; the Legion of Honor Museum from which Jefferson modeled his beloved Monticello, Virginia; Le Procope restaurant, Ben Franklin’s hangout as our ambassador during the American Revolution and where our Founding Fathers drafted ideas for our Constitution after the Revolution; Avenue du President Wilson; Place Charles De Gaulle, Avenue Franklin D. Roosevelt; and so much more. Of personal ecstasy were two places very special to me as a student and teacher of history; 1) the Place de Concorde where the guillotine was located during the French Revolution; 2) the Hall of Mirrors in the Palace of Versailles outside Paris where Woodrow Wilson signed the treaty ending World War I.
Oh, hell! Let’s close with a few “hoots”! – -Singing along with that accordion player pictured below. – -And then there was leading the entire tour bus in singing, “The Last Time I Saw Paris,” after the welcoming dinner in Paris with plenty of wine, also mentioned below. Day 2: Paris. 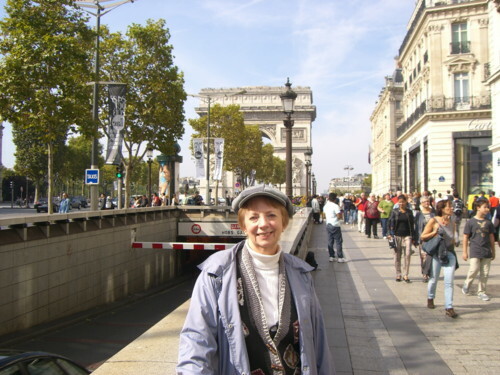 Sightseeing with a Local Guide features the Arc de Triomphe, Opéra, Madeleine, Louvre, and Champs-Elysées. Visit magnificent NOTRE DAME CATHEDRAL, and for a panoramic view, take the elevator to the second floor of the EIFFEL TOWER. Time to explore Paris on your own or to join an optional excursion to the magnificent Louvre Museum to admire the Mona Lisa. Day 3: Paris–Versailles–Beaune. Enjoy a special visit to the magnificent PALACE AND GARDENS OF VERSAILLES before heading for Burgundy. Arrive in Beaune, capital of the region, where a special [LF] WINE TASTING awaits you at the famous Marché Aux Vins wine cellar. Later, head for your overnight hotel, Le Cep, ideally located in the heart of the medieval town and just a couple of steps away from the famous Hôtel-Dieu and Notre Dame Basilica. Our room, hotel Le Cep, quite tone going back 400 years! Day 4: Beaune–Avignon–Pont Du Gard–Nîmes. Avignon is a town on the Rhône River that in the 14th century became the residence of the popes. Take pictures of the magnificent Palace of the Popes and the famous bridge, and browse through the colorful shops that sell traditional products of the Provence, like cloth, honey, herbs, and candy, like nougat. Continue to nearby Pont du Gard, and admire the largest remaining Roman Aqueduct in France, a monumental feat of engineering completed in the year 19 BC. Next is the pleasant town of Nîmes, where you will stay for two days. 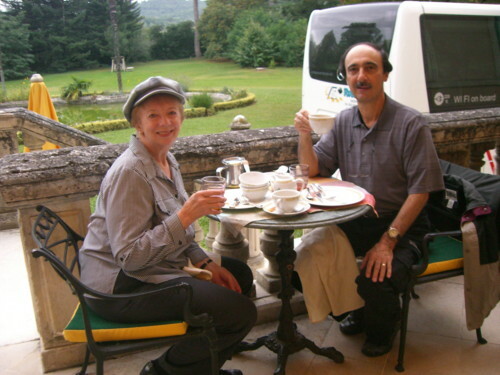 Breakfast at our two day stay, Chateau de Montcaud, Provence. 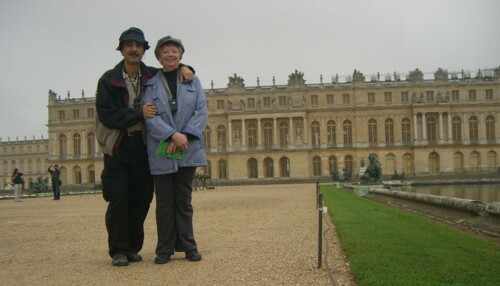 – -A real palace of a chateau! Day 5: Nîmes. Follow your Tour Director on a walking tour of the town. Balance of the day is at leisure. Choose from our optional excursions to spectacular Baux-de-Provence and historic Uzès to make the most of your stay. Day 6: Nîmes–Aix-en-Provence. Aix-en-Provence is one of France’s most elegant cities. It was the birthplace of painter Cézanne, and has always attracted artists from all over. Explore its center during your walking tour, and enjoy a [LF] light lunch at one of the many cafés to try out French pastries and get a real taste of this pretty city. Time to wander through the maze of small streets and along shaded Cours Mirabeau, and to admire its famous cafés and fountains—and don’t forget to try out the local calissons confectionery. 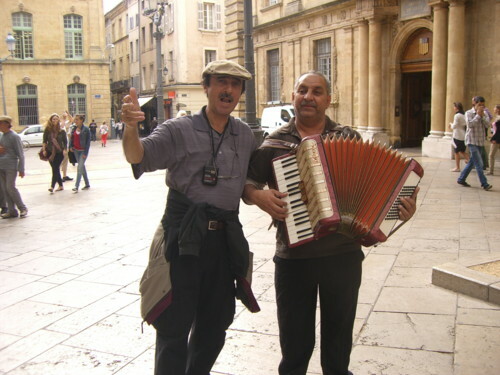 I found my accordion player in Aix-en-Provence! My pleasure translated into around 7 euro in his little cup by the time I had to let him move on his way! Day 7: Aix-en-Provence–Grasse–Nice–Monte Carlo. Arrive in Grasse, and learn all about perfume making during your visit to the famous Fragonard PERFUME FACTORY. 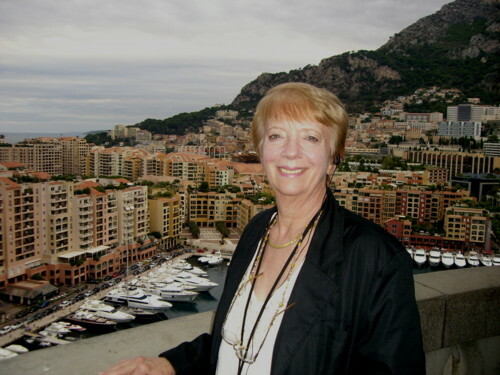 Then, turn to the glittering Mediterranean Sea and arrive in Nice, “Queen of the Riviera.” Free time to explore and walk along the famous Promenade des Anglais. A few more miles along the coastline to reach the miniature city of Monte Carlo, built on a rocky peninsula and famed for its nightlife. Tonight, capture the spirit and beauty of this magical place in your overnight surroundings situated in the Cap d’Ail harbor. Enjoy a special farewell dinner with wine at a local restaurant in Monte Carlo, to celebrate the success of your vacation. Famous & fabulous beach at Nice! 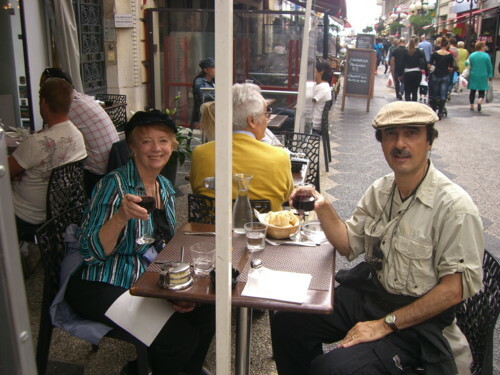 A cafe in Nice, very Italian as you inch closer to the Italian border. Geri with that Monaco scenery as backdrop! 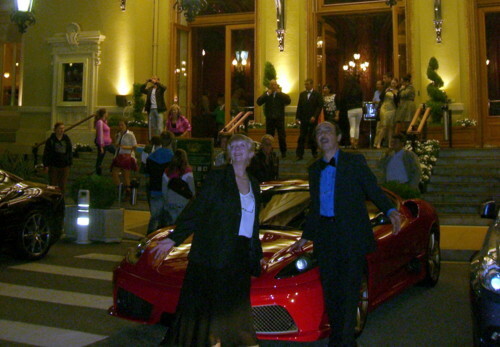 And what better finale than Monte Carlo Casino, Monaco! Day 8: Monte Carlo. Your vacation ends with breakfast this morning (the nearest airport is Nice). Excuse us for living, but this trip was grand! these photos look “very familiar”….bwahahaha! I think your trip was well well planned out and enjoyed to the max! Marg, You are THE EXPERT having been THE ONLY PERSON who has viewed all 300 photos!!!!!!!!!!!!!!!! That’s one special person if you ask me! We really mapped out Paris re what we wanted to see as you saw. And then Globus Tours did a great job on the rest of Paris & France! Thanks again! And we just got the “Cow Card” & kind sentiments! Thank you too! Phil & Geri too! What a trip! 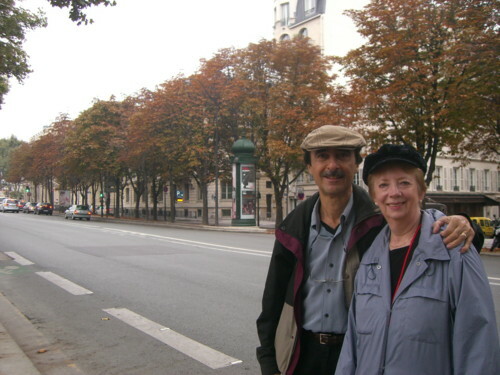 Maybe Joan and I will do this Globus tour in the future. You both look very French in your hats! Geri will get a kick out of seeing your comment! Ask Geri more about it if you consider it for the future. 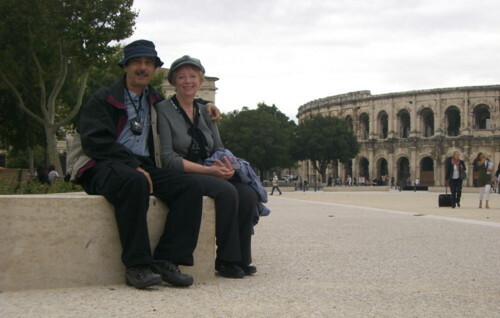 There is another Globus Tour very similar by Avalon River Cruise down the Rhone River. We debate between ourselves who sees more, bus tour or river cruise. While we prefer the river cruise, we think we see more by bus…..but not sure. We saw many riverboats docked in Avignon. We switched from river to bus before booking because the river cruise was upwards of $2000 more for two people. 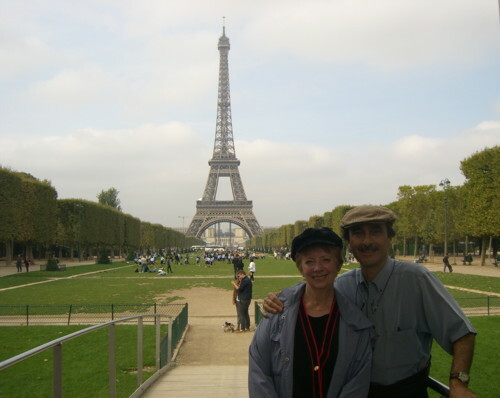 But then we added two pre-tour days in Paris, hotel & transfers maybe $839 or so more plus pocket money/meals for 2 days. Thanks about the French look. Our goal is to “keep them guessing” & not look like a waving American flag. Phil & Geri too! Excellent pictures for a wonderful trip! Thanks for sharing! What a glorious excursion you shared with us. And a history lesson to boot! Looks as though you and Geri had a very lovely time there.